The CRM system helps businesses to interact with customers, streamline processes, and improve profitability, it is a combination of internet, software, and functionality! Customer Relationship Management (CRM) refers to the technologies, practices, and strategies used by organizations for interacting and managing their current and potential customers. It also involves analyzing customer interactions throughout the customer lifecycle. 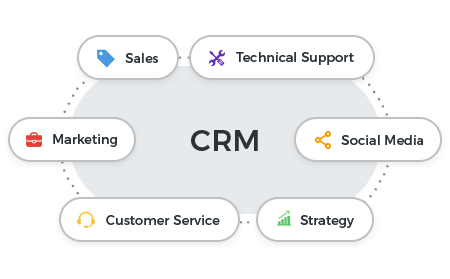 CRM is focused on enhancing customer service, improving business relationships, profitability, aiding in customer retention and driving sales growth. Customer Relationship Management (CRM) collects and consolidates customer data from various channels. The needed information for analysis is extracted from the company's website, live chat, direct mail, telephone, social media platforms, marketing materials and from other sources. A successful customer relationship strategy can manage both the business operations and customers interactions simultaneously. It often includes special software applications, called CRM software. It helps organizations in tracking and organizing their existing customer base. The ultimate aim of CRM is to establish a healthy relationship with customers so that they keep coming back- returning customers. As seen earlier, Customer Relationship Management software plays a critical role in achieving customer satisfaction. A good CRM program provides valuable insights into the customer behaviour which organizations can use to modify their business operations. 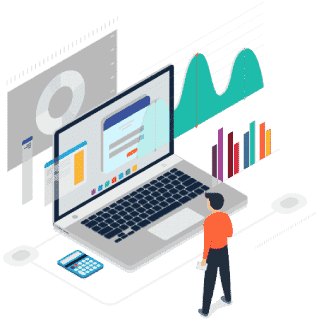 CRM software keeps track of customers' interests and helps organizations in modifying their products and services according to the customers' needs. The Customer Relationship Management software complies customer data and reports it into a single CRM database. This information helps key decision-makers in an organization to precisely assimilate and develop business plans based on the findings. Besides that, the information can be easily accessed and analyzed at any given point in time. In the recent times, numerous functionalities have been added to CRM systems. These new additions make CRM more complete and useful. The interactions between a customer and a company may happen through various platforms such as social media, emails, telephone, email, etc. Many organizations understand the dire need for recording those communications and archiving them for future purposes, CRM offers the right platform to record and archive such details. Besides this, it automates various workflow automation processes, such as tasks, calendars, and alerts. This enables the managers to track performance and productivity based on information logged in the system. #Marketing Automation: Customer Relationship Management tools with marketing automation capabilities can automate repeated tasks to improve marketing efforts. This can be implied at different points in the customer lifecycle. For instance, when a potential customer makes inquiries about the products or services, the system can automatically trigger an email or leave messages on social media with marketing materials, with the aim of converting that sales prospect into a full-fledged customer. #Salesforce Automation: Salesforce automation tools identify critical customer interactions and automate specific business functions of the sales cycle. This effectively helps in following up on the prospective leads, influence them and in the end, close it for a sale. The mechanism's key role is to add on new customers to the organization. #Contact Center Automation: The Contact Center Automation is intended for decreasing tedious aspects of a contact center agent's job. This may include prerecorded voice assists in customer problem-solving and information propagation. The different software tools co-operate with the agent's desktop tools to handle customer requests. This helps in bringing down the overall call handling time and simplifies other customer service processes. #Geolocation Technology: The Geolocation Technology also known as location-based service effectively help in creating geographic marketing campaigns. This is achieved by mapping customers' physical locations and at times combining with modern location-based GPS apps. This technology can also work as contact management tool to locate sales prospects based on geolocation. #Workflow Automation: The mundane workloads can easily be streamlined with the help of Customer Relationship Management systems. Businesses make use of workflow automation to remain more focused on priority tasks. #Lead Management: Lead Management can easily be operated, controlled and guided through the CRM system. The user will be able to track sales leads, analyze data for leads in one place and much more. #Human Resource Management: The HR people can effortlessly create, store and maintain employee information through the CRM system. Further, other tasks like performance reviews and benefits within a company can also be viewed on this platform. This allows the HR department people to more adequately regulate the internal workforce. #Analytics: The Customer Relationship Management Analytics offers the platform to build customer satisfaction rates using the customer feedback data. Though this requires analyzation of the accumulated data, it can be handled through the CRM systems without any strain. This also helps in creating effective marketing strategies for the business heads. #AI in CRM: The AI or Artifical Intelligence is the latest buzzword in the business space. Salesforce Einstein - One of the leading Artificial Intelligence Technology was built using the CRM systems to automate repetitive tasks. The AI is more capable of recognizing customer buying patterns to foretell future customer behaviors and more. The on-premises Customer Relationship Management (CRM) puts the key responsibilities namely maintenance, security, administration, control of information and database on the organization using the software. In this approach, the organization buys license upfront rather than buying annual subscriptions from the Cloud CRM provider. The software sits on the organization's in-house servers and the user bears the payment for all the upgrades. Generally, the installation process is prolonged but it integrates all of the organizational data into one. Organizations with unique CRM needs would definitely benefit from an on-premises deployment. The Cloud-Based Customer Relationship Management (CRM) is also known as on-demand CRM or SaaS (software as a service). The organizational data is collected and saved on an external remote network. The employees can obtain and make changes to the data anytime from anywhere of the globe provided there is a powerful internet connection to access from the Cloud. In some cases, the CRM solution may involve a third-party service provider overseeing installation and maintenance. The cloud's quick, relatively easy deployment capabilities appeal to businesses with limited technological expertise or resources. A lot of businesses approach the cloud-based CRM for its cost-effective advantage. On the other hand, we see vendors like Salesforce pricing the service by the number of users and on a subscription model, this may include a flexible option of monthly or yearly payments. The information security is a serious matter of concern for organizations using cloud-based systems. Since organizations don't manually control the storage and maintenance of its data, it is the duty of the cloud service provider to oversee such things. There is a possibility that a service provider goes out of business or is bought by another company, an organization's data can be jeopardized or lost. Besides this, compatibility issues can also arise when data is migrated from a company's internal system to the cloud. Finally, the price may be a matter of concern for few small and mid-size businesses, paying subscription fees for software can be quite expensive over time than on-premises models. As the name suggests, an Open source CRM makes source code available to the public. Mostly, the CRM services come at exorbitant prices and small to mid-size businesses cannot afford the big price. In Open source CRM, employing the system doesn't require shellingout a single penny from the corporate funds. They can simply enable the addition and customization of data links on social media channels, assisting companies looking to improve social CRM practices. The Open Source CRM platforms like SugarCRM, SuiteCRM, and OroCRMpresent the best alternatives to the paid platforms from Microsoft, Salesforce, and other vendors. It solely depends on an ogranization's resources, goals, and business needs for choosing the CRM and deploying it in their system. Previously, data collection for CRM systems was carried on by the sales and marketing departments. Since the advent of voice and chat services, it now chiefly includes the contact center agents too. The marketing and sales teams acquire the leads and store them in the system with information throughout the customer lifecycle. The contact centers collect those data and review the customer history records and also proceed to perform service calls and technical support interactions. The CRM system enables organizations to engage with their current and potential customers positively. The supporting social media platforms include Facebook, Twitter, LinkedIn and more. In today's customer trends, Social platforms offer an open forum for customers to vent out their grievances and also share their good experiences with a company. The appreciations received on this platforms help gain mileage and credibility. Promoting products or launching them is more promising and yielding in the present times. Businesses make use of multiple CRM tools to monitor customer interactions on social media. The customization may include specific mentions of a brand to the recurrence of keywords to discover their target audience and which platforms they use. All these activities help add value to the product. some more tools are helpful in analyzing social media feedback and address customer queries and issues. Today, businesses are keen on obtaining customer sentiments. For example, they are interested in learning the likelihood, will they recommend and overall satisfaction. This information helps the business heads to strategize the marketing moves and in improving the services. Most of the companies look forward to comprising the CRM data with other customer data received from sales or marketing departments to access from a single pane. It projects better on the view of the customer about the products and services. The CRM adds value for companies and customers through customer communities too. Here, the customers post reviews of products or even team up with other customers to crack the issues pertaining to products in real time. The customer communities come in handy for small level businesses to offer customer service for a particular set of problems and decrease the number of contact center calls. These communities are more capable of providing new product ideas or feedback. As per the modern day demands, CRM applications are built for tablet and smartphone usage. Marketing professionals and sales representatives who are vigilant round the clock want to access customer information and perform tasks from their preferred locations. Moblie CRM apps that are mainly devised for mobile devices, use GPS and voice-recognition capabilities to permit sales and marketing employees to access customer information from any part of the world. Challenges emerge when systems showcase duplicate customer information or outdated data. These issues can head towards the deterioration of the process in customer experience. All these things need to be addressed well. If you are looking for an effective CRM for your startup or existing business, the ITarian is the best choice because it offers traditional functions of a service desk with the added help of the customer relationship management product. Visit our official webpage to learn more! Did you find this article about CRM Definition helpful?